Certifications are essential in international business. "Worldwide, and especially in Asia, customers are more and more looking for companies with comprehensive certifications," explains Elisabeth Hofstätter-Kollarich, head of Quality & Management Systems at Anton Paar. Our company has been ISO 9001 certified for a long time, which confirms our high standards for the quality of our products and services. 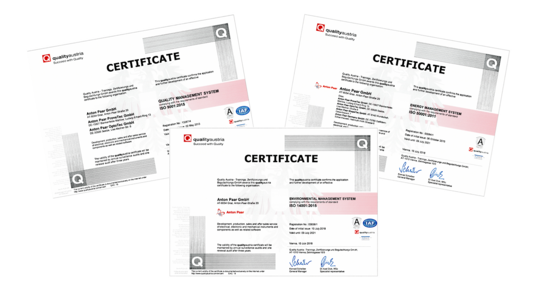 Recently, several companies of the Anton Paar Group have passed certification audits and received new certificates: ISO 9001:2015 fpr quality, ISO 50001:2011 for energy management and a new certification according to ISO 14001:2015 for the environmental management. Anton Paar ShapeTec is also ISO 13485:2016 certified; for activities in the medical technology sector. The certificates are proof of processes at an internationally high level. ISO 9001 focuses on customer satisfaction through qualitatively demanding and repeatable services. ISO 14001 and 50001 stand for systematic environmental and energy protection and thus for an important social responsibility that we demonstrably fulfill. In Austria, for example, this is reflected in the obligation to reduce energy consumption by one percent per year. Finally, ISO 13485 gives priority to the well-being of patients, which can only be guaranteed with flawless products.